Alright, I’m not proud, but I can’t lie to you guys: It was really freaking hard to give myself my first syringe injection of Enbrel. I’ve been using the pen injectors since March – 8 months! – but had been having problems with post-injection welts and bruising and button delays/glitches (I would press the top part of the pen and nothing would happen). You can read more about that here, here, and here. My marvelous nurse (who clearly thinks I’m tougher than I am) thought that I may be ready to try syringes. According to her, patients say the syringes are less painful. Also, since you’re in complete control, you can’t have glitchy buttons or not know if it worked. So, she gave me four syringes and told me to try it out. I got home on injection night from a really great dinner date and set up. I was feeling pretty confident. I’d even had some wine at dinner, which I thought should make things a little easier. I let the medicine get to room temperature, washed my hands, sat down, put rubbing alcohol on my thigh, iced my thigh, pinched the skin, went for the “dart-like motion” to inject myself…and froze. So I tried placing the needle on my thigh, thinking I’d just push it in…froze again. And then cried because I was frustrated. Why couldn’t I just do it? 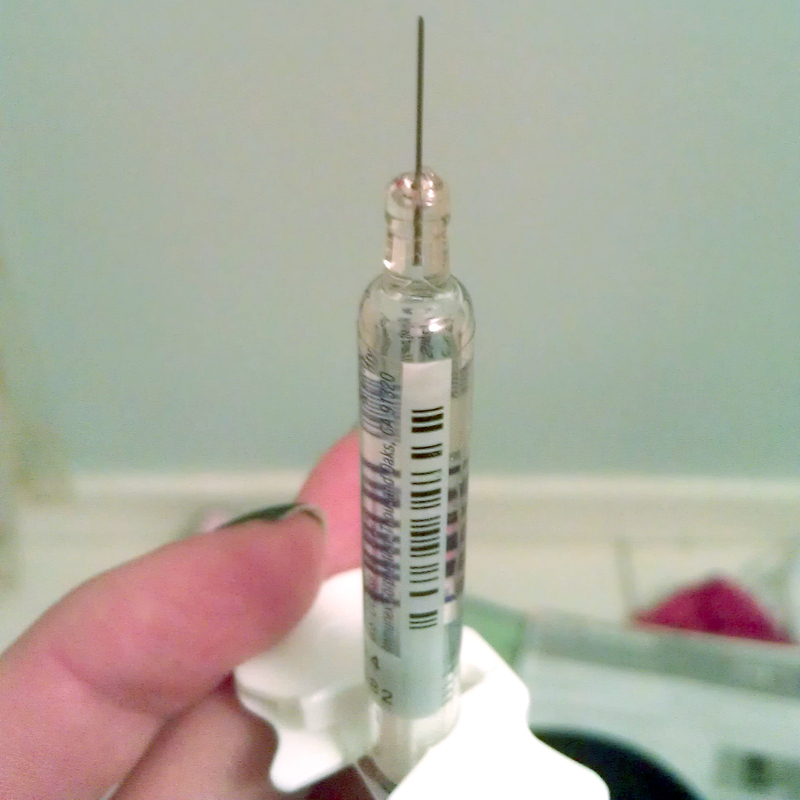 I don’t know about life energy, but the validation that it was a huge, scary needle made me feel a little better. I tried again. Still couldn’t make myself do it. At this point, it’d been about an hour and it was a little past midnight. Frustrated and wishing my cat had opposable thumbs and could do it for me, I called my little sister. She’s as wussy about needles as I am, but she does have an epi-pen (that she’s never used), so I thought maybe she could do it for me. She said yes, I could come over to her (college) apartment and she would try her best to stab me in the thigh. I said I’d give it one more go and call her back. The thought of driving over to my little sister’s and making her do it gave me renewed inspiration to man-up and do it myself. I would never want to give her an epi-pen! I knew that it would be hard for her to do it, even though it’s not her thigh. So I looked on YouTube and found this video. Seeing that this big guy was freaked about self injection too made me feel better. Also, his reaction – actually, not so bad! – gave me confidence. I didn’t do the “dart-like motion,” I just gently put more and more pressure on the needle until it punctured my skin and the full thing disappeared into my thigh. Success! I took a breath and pushed the liquid into me slowly. It didn’t hurt, it didn’t sting, it didn’t even bleed when I pulled it out. It’s less painful then the pen at least. I think it will go a lot better this week, since I know what to expect. And for those of you about to self-inject for the first time, I am here to report that it may be psychologically difficult to give yourself an injection, but it really truly is ACTUALLY, NOT SO BAD.